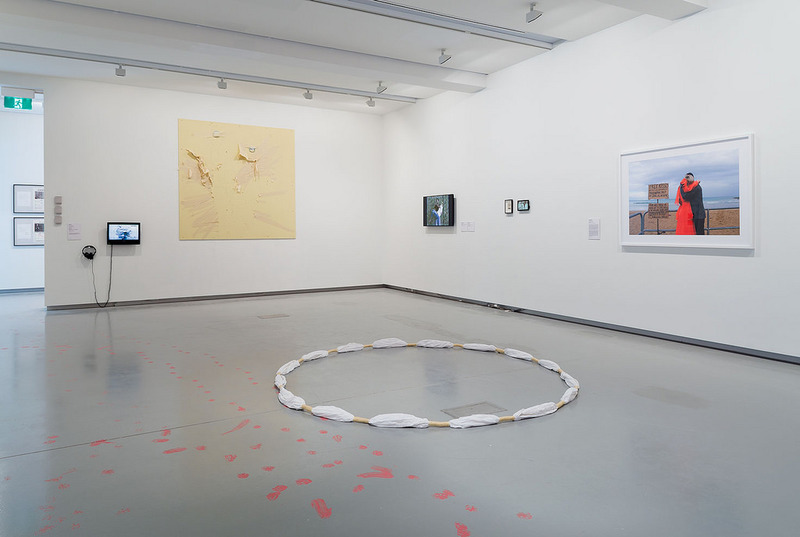 I had one work in it, the circular tug of war originally shown in Harald Szeeman’s 1971 Kaldor Public Art Projects exhibition I want to leave a nice well-done child here and I also wrote one of the three catalogue essays. The path from art as the manufacture of aesthetic objects to art as an activity, ‘art as a verb’ in the title of this exhibition, did not actually take very long, in my case about three years, but it did take another forty years before the art world could face up to admitting it had happened. The process for me had a simple, linear logic that I suspect was common in the late 1960s even if I took it further than most people did. It began with formalism. From 1968 I went from painting monochrome modular shaped canvases to installations to instruction and interactive works, each leading naturally to the next. By then the art object, in the sense of a discrete physical object, had disappeared from my work. Any objects left were only the detritus of normal life. I realised, however, that I was forcing my ideas into contrived forms in order to keep them in the gallery. Initially I dealt with this by narrowing my audience, by writing letters to my friends suggesting pointless changes to their living arrangements, for example. When these were reviewed (turning the critic into the distribution media) I began to realise that if everything was art then there was no such thing as ‘Art’. Of course I wasn’t the first person to notice this; even the conservative historian Ernst Gombrich had stated in his 1950 book The Story of Art, ‘There really is no such thing as Art. There are only artists.’ I had read it in my teens but it had taken a few years to sink in enough for me to believe it was my own unique insight. I soon discovered a whole raft of others who had said it as well. This was the dead end I had reached in mid-1971 when along came the NSW Builders Labourers Federation and the green ban movement. (1) It struck me that the BLF’s bans in support of environmental or heritage issues were a sophisticated urban scale version of the domestic interventions I was tentatively making and therefore as a collaborative group they should be seen not just as artists but possibly the most effective artists in the world at that time. I was soon swept up into the most contentious and violent green ban of all (Victoria Street, Potts Point) and Sydney’s first large squat to defend the street where we were in turn subjected to bashings, kidnappings and ultimately a murder. By 1974, in the shell shocked aftermath, it had become clear to me that what mattered was the role of the artist as an agent of cultural change rather than a manufacturer of art market novelties. From that point, although I remained involved in the art world through activities like helping to set up the Artworkers Union or working with Frank Watters on his Hunter Valley Coal Mining project, I no longer regarded it as a worthwhile audience. My activities focused on trade unions and community groups and involved media and targeted cultural fracture points. As far as the art world was concerned I had stopped being an artist because I was not manufacturing products for exhibit and sale. I even said so myself occasionally, given that I certainly no longer made things, I did things. The reason it is worth detailing my personal history is that I know something similar happened to numerous other artists around the world during the 1970s. The dematerialisation of the art object, as Lucy Lippard described it, caused more than one crisis. Accepting the underlying critical logic of conceptualism would in fact have closed down the art world but both artists and galleries needed a saleable product in order to make money. Furthermore both commercial and institutional organisations had enormous investments in buildings that were only good for exhibitions and inappropriate for other forms of communication or distribution. Although it was said that the institutional definition of art was ‘it’s art because we say so’, in reality the definition was ‘it’s art because we can exhibit it’; essentially a business model rather than a cultural proposition. As the decade wore on, the radicalism of much conceptual art slowly dissipated into the development of marketable forms and the object rematerialised as everything from documentation to ‘conceptual’ painting – a real case of meet the new art, same as the old art. But that was only part of the story. The simple reality is that art forked in the 1970s. One group of artists went on to collaborate in sustaining the institutional art world, that social/political power construct that administers the institutional definition of art. The subsequent history of conceptual art has mostly focused on those artists who followed the institutional track, whose work was supported by the institutions in return for their loyalty to the prevailing business model. This of course resulted in a form of timid ‘conceptualesque’ art that bore more resemblance to a commodity in the market economy than to art as cultural action. Artists whose work was not so safe for institutional use were marginalised or completely repressed, only to slowly creep back into focus again in the last decade. This was post object art, as Donald Brook called the tendency. At first best described as activist artists, they mostly went on to operate outside the art world often using media the art world did not regard as legitimate and forms that were indistinguishable from normal daily life but involved ‘memetic innovation’, the manipulation of cultural memes. Many activist artists became embedded in early 1980s politics where they demonstrated what were to become characteristic techniques: the use of a wide range of media; collaborative work with other community groups; anonymity at least as far as the art world was concerned; blending of high and low cultural forms and non-art forms; and the development of innovative means of distribution and marketing. All these techniques were clear in the urgent art based campaigns around Lesbian Gay Bisexual Transexual Intersex (LGBTI) issues as the first waves of HIV/AIDS deaths occurred. For others like me it occurred through working with the trade unions, initially in the green ban movement, then with Dale Keeling in setting up Union Media Services, probably one of the first specialist social marketing organisations in the world, and later again with Ian Burn. Although we produced publications and campaigns for trade unions and community groups, our real work, as we saw it, was our overt (and successful) agenda to reform trade union communications. It was about activity rather than objects, real world rather than art world, verb rather than noun. Of course the divide was not completely clear cut. The artists who managed to have a foot in both camps, those who sought art world validation by their apparent rejection of it – whether Keith Haring, Josef Beuys or Ian Burn – were suitably rewarded while those who refused were suitably punished. But in many ways that didn’t matter. For artists developing an ongoing practice outside the art world the issues soon became quite different. Firstly, the idea of producing an art product was not even a question, whether you did or whether you didn’t depended on what was effective in the circumstances. The art world itself was just one of many available distribution systems and a minor one at that. Secondly, anonymity and invisibility were often assets. The heroic individual artist was as dead as the art product. Being ignored by the art world was only an issue insofar as it made it difficult to argue against the neoliberal consensus that was consolidating there, that defined art as just another form of manufacture for profit. Outside the art world, ostentatious self-identification as an artist complicated collaborations and made it difficult to blend into communities where the artists’ skills were only one skill set amongst many. Thirdly, there was the issue of audiences. Once you stepped outside the art world echo chamber it was clear that it was just another segment of the mass audience. Like all audience segments it had its own expectations, preferred behaviours and privileged forms of coded communication but essentially it had become a status enhancing form of entertainment. Seen in that way, there was nothing special about making art objects and exhibitions, they were simply a niche form for a very small audience of collector/speculators whose attitudes in Australia tended to be narrow and conservative. Other easily defined audiences, union members for instance, were enormous by comparison and organised in politically effective ways. There were now only two reasons to treat the art world as significant and that was because the art world controlled museums and a small segment of the art audience was interested in the theoretical debate about the nature of cultural activity. Finally, there was the issue of appropriate form. Each audience segment tended to have a preferred media, whether it was in ‘art’ form, or union journals, graffiti or posters, demonstrations or policy documents. Obviously in the course of cultural activism it was inevitable that a lot of ‘stuff’ would get generated – publications, documentation, publicity. The stuff was not intended as merchandise for a market but rather as functional in a broader cultural process. Even if it was collected, and political posters were always widely collected, it was like bottle collecting. The real significance of a poster was its effectiveness in getting people to a demonstration or a fund raiser, to make a poster for collectors was essentially to act in bad faith. This is the point where ‘art as a verb’ really starts to make sense. As Vladimir Tatlin said, ‘I am an artist, I provide ideas.’ It was the ideas that mattered; the physical form was nothing more than one of many possible means of disseminating the idea. The form was to be judged by its effectiveness as a means to action rather than as an end worthy of great discussion in itself. But that was then. By now we are looking at a long running movement stretching back forty years. During that period the institutions mostly avoided dealing with post-object art. They did make several attempts at appropriating it, from relational aesthetics to social practice to Tino Sehgal’s parodies. None of these brought it back under institutional control although they eventually reached an uneasy truce with street art. While the volume of conventional art grows exponentially, its significance shrinks even faster, and as the art world becomes a giant casino playing with crapstraction gambling chips, it is clear that the most significant cultural activity must be, has been, occurring elsewhere. The growing number of museum shows that are now poking around the edges of this alternate history are mostly made up of those artists who retained a toehold in the institutional art world. Nonetheless there seems to be the recognition that they are just the tip of a very large iceberg. The ubiquitous media of our day-to-day lives is a sign that the blending of art into ordinary life has now happened. The movement is over because it succeeded spectacularly and is so pervasive that it is hardly commented on. Its consequences are there in YouTube mashups and Facebook memes, in open source software, in hacktivism and street art, in bedroom music recordings and cosplay, in zines and blogs and self-published ebooks, in creative commons Flickr photo albums and Instagram, in other words, in the abundant playful production of people who would mostly never call themselves artists and yet clearly are. (1) Green bans were bans on demolition or building work imposed by the NSW Builders Labourers Federation (BLF) at the request of resident action groups. Forty two bans were imposed on sites of environmental or heritage significance between 1971 and 1974. Although later defeated, the bans exposure of systematic corruption in the planning process led to significant changes in planning and heritage legislation. The example they set also led to the formation of the German Green Party. (2) The exhibition had been strongly supported from its conception by curators Daniel Thomas and Frances Lindsay. The Director Peter Laverty and Deputy Director Gil Docking argued in support of the exhibition and recorded their disagreement with the Trustees decision in the Trustees Minute Book. Many years later renewed interest in this unrealised project led to a collaborative version with Lucas Ihlein being exhibited in Power to the People: Contemporary Conceptualism and the Object in Art at the Australian Centre for Contemporary Art in 2011. In November 2013, Lucas and I finally showed the complete Yeomans Project at AGNSW, 38 years after its original scheduled date.